We've already had some indication that HTC's take on Windows Mobile 6.5, the HD2, would be headed to T-Mobile UK, and heard straight from HTC itself that the phone would indeed be headed to the US in next year, but it looks like we may now have one more key piece of the puzzle. If that slide pictured above is authentic as it's purported to be, it looks like the smartphone will be heading to none other than T-Mobile USA, and presumably sometime in that "early 2010" period HTC mentioned. Of course, this slide noticeably doesn't make mention of Windows Mobile at all, so the phone in question could also conceivably be HTC's rumored Android-based Dragon handset -- or... not. 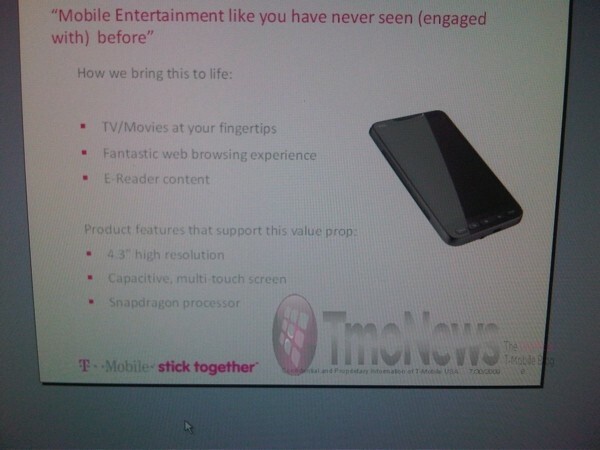 HTC HD2 turns up in purported T-Mobile USA materials originally appeared on Engadget Mobile on Wed, 14 Oct 2009 18:23:00 EST. Please see our terms for use of feeds.